While this battle resulted in defeat, I consider it a successful encounter. This was a 3-way 1,000 point per side fight between my Bretonnians, my son's Empire, and my fiancee's Wood Elves. The objective was to take and hold an ancient magical ruin, found in the region where the 3 factions meet. The objective was to move at least one model into the ruins and keep it there for one full round, with no enemy models in the ruins at the same time at the end of the round. Midsummer’s Day, the year 1358 after the founding of our Glorious Realm. Sire, it is my duty to recount this tale and pass on to you these papers. Upon the early morning of the Spring Equinox, two woodsmen, who were subsequently found to have been snaring rabbits and other game (a crime for which they have been flogged) upon the edges of the Bois de Loren, came upon a Knight, who’d staggered across the Ford of the Sentinels, upon the Brionne. He was in a much dishevelled state and commanded their succour. He claimed to be Duke Melmon of Quennelles, a claim they doubted and decided that he’d suffered a fall from his horse and was somewhat concussed. Nonetheless, they did give him aid and assistance, for which their chastisement was reduced in both duration and severity, showing true magnanimity of their Lord. My fellow Knights....Thank you for continuing to stay for the story of my Masters accounts. Now that you all have filled your tankard with a new beverage, I continue my lords battles. Hello Fellow Bretonnians...I am Armond the farmer, Friend, squire and commander of my lord Sir Christoph Tetreaux's Crimson men-at-arms company. I bring you a detailed account of my Lords most recent battles. As you well might know, My Lord has been on a search for the grail since he defeated the dreaded Demon Belakor in a Challenge durring the Storm of Chaos battles ordered by the King to defend Bretonnian's neighbors, the Empire. In these most recent battles, for the first time, he followed a small unit of Grail Knights and their lowly but loyal pilgremage, hoping they bring him closer to what he wants to attain.....An encounter with the Lady of the Lake! The first battle since joining the Grail Knights were against a raiding party of Skaven, carrying what looked to be a Huge Brass Bell. My lord has never encountered one of these huge icons of the lowly rat-men, but this didn't deter him from wiping them off this field of battle today. Another Warhammer PC game: W.A.R. For some it might be old news, but new information for others at the same time. There is definately going to be a MMORPG in the Warhammer World, targeted as direct rival to World of Warcraft. 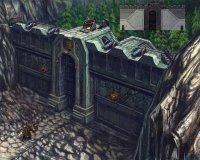 After the first failed attempt of GW with Warhammer Online, there are now new interesting pictures from W.A.R. (Warhammer Age Of Reckoning), being developed by Mythic Entertainment. There is no confirmation of a Representation of Bretonnia (...yet? ), but the players can definately be of Human race among others. Everything seems to be centered around the Empire, though. In the March Preview, there are a many interesting concept pictures, be sure to check them out. Release Date is planned to be 2007. The following is a request posted at the Warvault Community Forums by IBBoard, admin of Hive World Terra. I strongly support his request, maybe someone with a little time from our Bretonnian Community can be found to have a look after the army files for Bretonnia... everyone would benefit from it! Firstly, a brief explanation of Rollcall before everyone starts looking blank about my request! Rollcall is an army builder program (like Wolflair's Army Builder, only more closely aimed at Warhammer/40K and, more importantly, free!). It was originally created by John L Martin in 1997, was maintained byMudipaws for a while, and is now maintained and hosted by myself at Hive World Terra.